Michigan faces off against Villanova tonight in the championship game of the 2018 tournament. Villanova has a 81% win probability by my numbers, and a 75% implied chance according to the markets. However, this game fascinates beyond analytics and markets. I follow this Michigan basketball team and watch most of their games. It’s an opportunity to combine numbers with basketball insight. Here are 3 key insights into Michigan versus Villanova. Jay Wright’s teams always play great defense. Based on my points per possession adjusted for schedule, Villanova hasn’t ranked worse than 11th the past 3 seasons. Heading into the 2018 tournament, Villanova ranked 19th on defense. I thought this might be a flaw, as their biggest player Omari Spellman stands only 6’8″. However, their defense rank has risen to 12th heading into this championship game. Despite their lack of size, Villanova has athletic, long wing players like Mikal Bridges. Michigan will see flying limbs when they shoot, much like their Elite Eight game against Florida State. In contrast, John Beilein isn’t known for defense. When Michigan made the championship game against Louisville in the 2013 tournament, they finished 39th on defense that season. Michigan played their best defense towards the end of the season as they entered the tournament 59th in the nation. However, Michigan’s defense has improved dramatically over the past two seasons. Heading into tonight’s championship games, they rank 4th in defense. When the offense sputtered against Florida State and Loyola Chicago, Michigan’s defense carried them to victory. Michigan is particularly good at not allowing opponents to shoot 3 pointers. Opponents take 29.8% of their field goal attempts from 3, which makes Michigan 5th best in the nation at preventing 3 point shots. In addition, Ken Pomeroy has shown that 3 point field goal rate is useful in predicting future games. This means Michigan should be able to limit Villanova’s 3 point attempts. Point guard Jalen Brunson runs Villanova’s high powered offense, ranked 1st by my points per possession adjusted for opponent. However, he will face a tough test in Michigan’s Zavier Simpson, an elite defender. My guess is that Simpson will get close to Brunson so he can’t shoot a jump shot. In addition, Brunson is left handed, so Simpson can shade him to his right. Simpson will trust his quickness to recover should Brunson drive to his right. Simpson won’t be able to shut down Brunson. However, slowing down the leader of the Wildcats is key to pulling off the upset. Villanova has a much better offense (1st) than Michigan (25th) by my points per possession adjusted for opponent. A big part of this edge is three point shooting, as Villanova has made 40.1% compared to 35.7% for Michigan. However, these 3 point shooting rates have inherent error. For a Michigan team that has taken 988 attempts, their true 3 point percentage has a two in three chance to be between 34.4% and 36.9%. To guess whether a team’s shooting percentage is higher or lower than their true skill, we can look at how a player’s rate compares with previous seasons. For Michigan, Moritz Wagner and Muhammad-Ali Abdur-Rahkman have shot the same percentage from 3 as last year. However, Duncan Robinson’s 38.7% this season is down from his 42.4% and 45.2% the past two seasons. Some of this change comes from better defense, as every opponent knows Robinson can shoot. However, he has missed his share of wide open 3 point shots this year. I don’t think he’s a worse shooter now than the past two season. Robinson is most likely better than this 38.7% this season, and Michigan will need this shooting against Villanova. For Villanova, Jalen Brunson, Mikal Bridges and Donte DiVincenzo have all shot career highs from the 3 point range. And they probably didn’t just get lucky with their shooting this season. Players can improve their shot with practice in the gym during the off season. However, whenever a team is top 10 in the nation from 3, you can expect regression. In addition, Brunson, Bridges and DiVincenzo played big roles on last year’s Villanova team that shot 36.9% from 3. They will especially difficult against a Michigan defense designed to not allow open 3 point shots. Michigan and Villanova shoot a ton of 3 point shots, as they take 43.2% and 47.5% of their field goal attempts from 3 respectively. The shots will fly, and we will see a small sample size of the results. If Michigan can get fortunate with the 3 point lottery, it will help their efforts to pull off the upset. Why should you believe in sports analytics? Have numbers ever helped a team? Predictive analytics can help you win your March Madness pool, but how about a real example in which numbers helped a team? An example so obvious that even a team’s most bitter rival can see the change? I stumbled across a story this fall. In November of 2017, Michigan basketball coach John Beilein spoke at the Exercise and Sports Science Initiative (ESSI) Symposium at the University of Michigan. He talked about how his team uses technology from Catapult to track the work rate of players. During the 2016-2017 season, he noticed point guard Derrick Walton was working harder than his teammates the day before games. If Catapult quantified the work rate of others at 800, then Walton measured at 1000. Beilein didn’t think this 25% extra work was necessary, so he asked Walton to tone it down the day before games. After his talk, I raised my hand to ask whether he made this change in January. To understand why I asked about this specific time, let’s go back to Michigan’s 2016-2017 season. Michigan struggled during the first part of conference play in January of 2017. They started 1-3 against Big Ten competition and looked terrible. Derrick Walton was a part of the problem, as he wasn’t playing well. We’ll get into specifics soon. But first, let’s look back on why many Michigan fans liked Walton. He started as a freshman on a Michigan team that made the Elite Eight. He got injured his sophomore year, but his three point shooting and ability to get to the basket seemed to projected a bright future. During the start of his junior year, I tweeted this. Michigan guard Derrick Walton looked great tonight. Best shot on the team to be B1G player of the year. More than a year later, this tweet didn’t seem insightful as Walton struggled into his senior season. He looked like an average Big Ten point guard, and I gave up on him as a game changing player. I remember asking Sam Webb about Walton, as the point guard seemed like a hard worker destined for success. Webb, the ultimate Michigan football and basketball insider, confirmed his work ethic but also wondered why Walton wasn’t playing better. Then, starting in January of 2017, Walton goes on a tear. On January 14, 2017, Michigan played Nebraska. Before this game, Walton converted 38% of his two point shots. Starting with Nebraska, he made 49% of his two point shots. For a guard like Walton, two pointers represent high energy shots like lay ups or a pull up jumpers. More energy during games could contribute to this increase in field goal percentage. Randomness plays a bigger role in 3 point jumpers, but Walton also improved in this area. He hit 40% of his 3 pointers before Nebraska, but then 44% after. Known as a great rebounder, Walton’s rebounding improved as well. His rebounds per minute increased 25% starting with the Nebraska game compared to before that game. Michigan played better basketball starting with Nebraska. They ended the season 9-5 against Big Ten competition. However, they still needed to win games in the Big Ten tournament to make the NCAA tournament. Then, the Michigan basketball team almost died. As they tried to fly to Washington DC for the Big Ten tournament, strong winds swept their plane off the runway. Luckily, no one was seriously hurt. The experience shook Michigan to a higher level. They won the Big Ten tournament, as Derrick Walton took home Most Valuable Player honors. Michigan now had an automatic berth into the NCAA tournament, and they beat Oklahoma State in a close opening round game. Then, as a 7 seed, Michigan beat 2 seed Louisville in their best game of the season to make the Sweet 16. Their Sweet 16 game against Oregon went down to the wire. Down 1 point in the waning seconds of regulation, Walton had a pull up jumper from about 15 feet that would have won the game. In the fairy tale, the shot drops and Michigan advances to the Elite Eight. In reality, the shot bounced off the rim. No matter the result, Derrick Walton’s play led Michigan on a remarkable run to close the 2018 season. He now plays for the Miami Heat. Walton’s run started in January, so it prompted me to ask coach Beilein whether he made Walton tone it down in practice around then because of the player tracking data. Cover image courtesy of Marc-Gregor. How should you divide credit between the offensive line and running backs on rush plays? One method is Line Yards, a metric developed by Football Outsiders to capture the contribution of the line. The offensive line gets full credit for the first 4 yards of any run, but half credit for the next 6 as the running back gets past the defensive line. The running back gets full credit beyond 10 yards. To give a football example of how this works, consider the line yards per carry for Michigan through week 10 for the 2017 season. Michigan struggled early in the season against teams like Air Force and Purdue. But since the Michigan State game, Michigan’s run blocking has improved by line yards per carry. The last two games show how line yards breaks down the contribution between the offensive line and running backs. Against Rutgers, Michigan had 3.62 line yards per carry. They rushed for 334 yards on 6.55 yards per carry (numbers do not include sacks, although Michigan didn’t allow any against Rutgers). Michigan had slightly worse line yards per carry against Minnesota: 3.54 compared to the 3.62 against Rutgers. However, the offense rushed for 394 yards on 11.59 yards per carry, an astounding rate. The line yards gives about the same credit to the Michigan’s offensive line against both Rutgers and Minnesota. The running backs get the extra credit against Minnesota, as Karan Higdon (47, 77 yards) and Chris Evans (60, 67 yards) both broke long runs. In contrast, Michigan’s longest runs were 49 and 32 against Rutgers. I groaned when I first looked at my 2017 college preseason numbers. The numbers spit out Michigan as 30th, too low in my opinion. This low rank comes from two factors. The model uses a 4 year window of team performance, which includes two mediocre years under Brady Hoke before Jim Harbaugh returned as coach. Also, Michigan only returns 5 starters from last season. However, one expects better than 30th from a Jim Harbaugh team. While past performance is no guarantee of future success, he did wonders with a Stanford program. Check out the visual at the top of this post. To adjust Michigan’s preseason rank, I considered two factors from the markets. First, consider Michigan’s win total based on their schedule. They have difficult, toss up type games against Florida at a neutral site, at Wisconsin, at Penn State and Ohio State. Suppose they go 2-2 in these games. For the remaining 8 games, Michigan will most likely lose one game despite being a substantial favorite in each game. Football lacks certainty, and some combination of poor play and turnovers can lead to unexpected losses like Michigan at Iowa last season. This gives a win total of 9 for Michigan in 2017, the same total posted in the markets. In addition, Michigan is a four point favorite against Florida in their opening game. I used these two factors to adjust Michigan, erring on the low side for each factor. This led to a rank of 9th for Michigan in 2017 with an expected win total of 8.8. The preseason Coaches poll also ranked Michigan 9th. In the HBO series Entourage, Vincent Chase is the big movie star. He takes the leading role in the biggest Hollywood movies, then does what he wants with the ladies around town. Then he meets Mandy Moore. They date twice. It ends twice, with Vinny on the break up diet of orange juice and crackers both times. Even the the most desirable people meet their match, and for Vinny it was Mandy Moore. Just like Vinny, The Power Rank’s preseason rankings are typically stellar. Over the past 3 season, the model has predicted the game winner in 70.8% of games (1452-598 with no prediction in 235 games), a rate that doesn’t include cupcake games with FBS teams against FCS opponents. Note that the preseason model makes these predictions without using any data from the regular season. While I’m usually confident in the predictions of this model, Jim Harbaugh broke it this season. Let me explain. My preseason college football rankings come from a regression model that considers the last 4 years of team performance, turnovers and returning starters. The team performance comes from my ranking algorithm that takes margin of victory and adjusts for strength of schedule. Four years might seem like a long window to use, but college football teams tend to persist in their performances from season to season. Alabama has the tradition, financial resources and the coach to stay near the top of college football every season. Rice has none of these advantages to dig them out of the bottom of FBS. Because of this 4 year period, the preseason model gives poor predictions when teams get better or worse in a rapid manner. 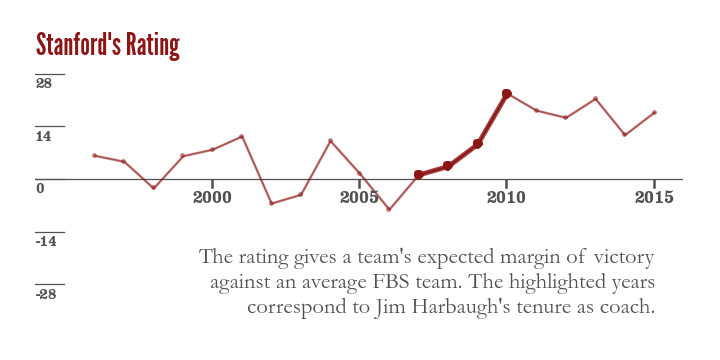 To see this, check out the visual of Jim Harbaugh’s tenure at Stanford, which shows their rating, or an expected margin of victory against an average FBS team. Any model that attempts to predict Harbaugh’s 3rd year at Stanford from the previous four years would underestimate the strength of that team. For Michigan in 2017, the preseason model has the same problem. Harbaugh has been coach for two years, so the model still considers the last two seasons of the Brady Hoke era. To make things worse, Michigan returns only 5 starters, the lowest in all of FBS. This contributes to my preseason rank for Michigan of 30th. From following this team closely, a rank of 30th is too low. I’ll make an adjustment to this model before calculating a win total for Michigan in 2017. Beyond the clear problems of using a large window of team performance, a look at the roster gives other reasons for optimism. Neither Rashan Gary nor Maurice Hurst, defensive linemen, count as returning starters. However, the two combined for 16.5 tackles for loss last season, and both players have the potential to be first team All-American. Michigan loses all of their starters in the secondary. While this would be a concern for most teams, most Michigan fans believe there’s enough talent to perform well in 2017. The same holds for the receivers on offense that will get the ball from QB Wilton Speight. The big question for Michigan in 2017 is the offensive line. This unit struggled last season, making the NFL starters that Harbaugh and offensive line coach Tim Drevno turned out at Stanford seem like a distant memory. If Michigan performs anywhere near where my preseason model predicts, the offensive line will take the blame. To check out the full 2017 preseason rankings, click here.